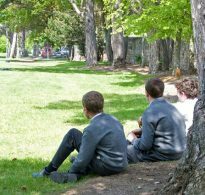 The Blackrock College Parents’ Association (BCPA) comprises the Parents’ Council and 5 Year Committees (2nd to 6th Year) and the Boarding School Parents’ Committee. The Parents’ Association organises social, spiritual, and charitable events throughout the year. They also support the College in the delivery of the educational process. In addition there is a Parents’ Choir which performs at the Leman Concert inter alia. There are 6 (including 1st Year) Year Committees with 14 parents on each Committee. They meet with the relevant Dean during the academic year to discuss matters relating to their children’s education and development. The Committee organises social functions for fellow parents as well as evening lectures relating to parenting and adolescent issues. The Parents’ Council is made up of 2 parents from each Year Committee including 1st Year (Willow Park) as well as the College Spiritual Director, the College Principal, the Vice President of the Union, a nominee from the Boarding School Parents’ Committee and a representative from the teaching staff. Welcome from the Chair of Blackrock College Parents’ Association.